I always seem to be behind in my cards when it comes to all holidays except for Christmas (and yes, my Christmas/Holiday cards are usually made by now). This year I was able to make my Valentines day cards a good week in advance, yeah me! Having made English Pancakes in celebration for Shrove Tuesday, I figure I should start making some Easter cards now. A while ago, I coloured this Bunny Masterpiece with copic markers, cut it out with one of my a nestabilitie dies and tossed it into my coloured image collection box. This weeks High Hopes Challenge is to use three Designer Papers, three flowers, and three buttons. This challenge coupled with a flip through the Taylored Expressions Sketch Book (my new layout bible) resulted in this card. Buttons: Tutti Fruitti Boutique Buttons stitched to card using DMC floss. Thanks for visiting, feel free to leave a comment! Cute card, I am amazed at your colored image box- how beautiful it is! Looks like you like High Hopes as much as me-- LOL! 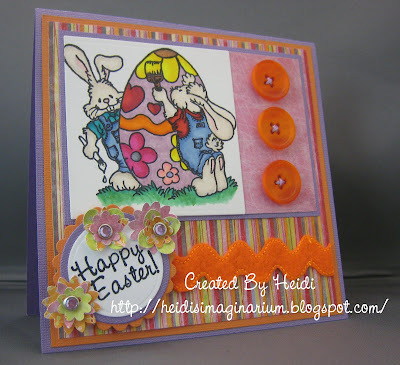 I have a coloured image box too :) Love your easter card! This image is really cute (and one I don't actually have--yet)! Your colouring is really nice as well as your layout--I like how the orange zigzag ribbon matches the egg!! Beautiful colouring and details, love your design. Awesome stash of coloured High Hopes images...wow!! Thanks for joining us for the High Hopes Challenge. WOW!!! Look at your stash of colored images! They all look stunning and you are way too organized! Love your Easter card! We made pancakes too for Shrove Tuesday or Breakfast for Supper as my kids call it! LOL! Thanks for joining in at the High Hopes challenge this week! Absolutely beautiful! And like everyone else, I am in awe of your colored image stash! Look at all those HH images! I think you have more than I do, lol!! Thanks so much for playing along! Wow! That is a huge pile of colored images...man, if I did that, I would always be on time with my cards!! Thank you so much for playing along with our challenge last week and congratulations on winning the prize! We have another great one this week...add texture!! We hope you can play along again!! Congratulations Heidi! Your card is so cute and I love all of the layers. So happy for you! Congratulations Heidi! A well-deserved win, I love your gorgeous colourful card!